I’ve been very quiet on the blog lately, i’ve not given up, actually there is lots of news to come soon on completed work, major new projects and forthcoming events. This bleached sycamore and stainless steel pair that have just sold. It’s a nice story in itself; the clients who are very local to the workshop first saw them during Dorset Art Weeks 2010, it has just taken 4 years for the sale to come off. I remember them from the show and felt sure they would come back. It’s amazing this set of tables hadn’t sold, perhaps they just had their name on them! It all bodes well as a lead-up to Dorset Art Weeks 2014, which starts on the 24th May and runs through until 8th June. There will be plenty more on DAW very soon! It seems only right I’m left with the scorched oak Torii tables. 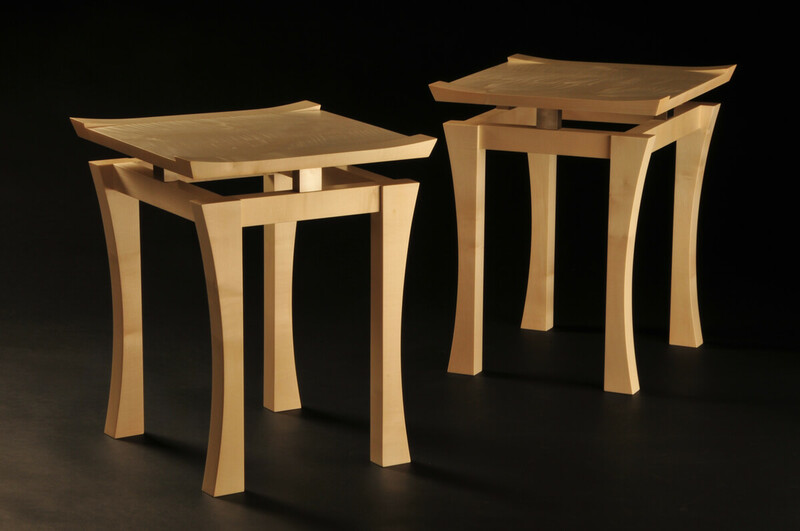 They were the final set of this limited edition, there were 12 sets made over 12 years in various timber combinations. The scorched oak pair are the most sculptural of the sets we made and as a result the least ‘furniture like’. They are also closely associated, in my mind at least, to a memorable trip to Japan and strong memories of my late brother. There is more on that in the preceding blog story. It feels like a chapter closing in a way, but in a good way.